Republicans hailed John Roberts as the "brightest of the bright" as the Senate began debate Monday on his near-certain confirmation as the nation's next Supreme Court chief justice. President Bush said earlier in the day he was "cautiously optimistic" Roberts would be confirmed and indicated he was already working on his next pick for the high court. He hinted that his nominee would be a woman or a minority, saying that "diversity is one of the strengths of the country." The Senate and the White House will focus both on Roberts and the upcoming replacement for the retiring Justice Sandra Day O'Connor this week, 19 years after the late William H. Rehnquist was sworn in as chief justice. Roberts is "the brightest of the bright," declared Senate Majority Leader Bill Frist, R-Tenn.
Roberts, 50, is the first nominee to the nation's high court since 1994, and was considered to be one of the nation's top appellate lawyers before being promoted to the U.S. Appeals Court by Mr. Bush in 2003. He argued 39 cases before the Supreme Court, becoming very familiar with the eight justices he will lead as chief justice. "The word is that the justices very much applaud his nomination to be chief justice," said Senate Judiciary Committee Chairman Arlen Specter, R-Pa. "He has the potential, almost from a running start, to bring a new day and a new era to the Supreme Court." Frist and Minority Leader Harry Reid, D-Nev., expect Roberts to be confirmed by Thursday, and Mr. Bush was expected to make his next selection for the Supreme Court soon after that. "I will pick a person who can do the job. But I am mindful that diversity is one of the strengths of the country," Mr. Bush said Monday. He is under pressure from many quarters — including his wife — to pick a woman or a minority for O'Connor's seat. 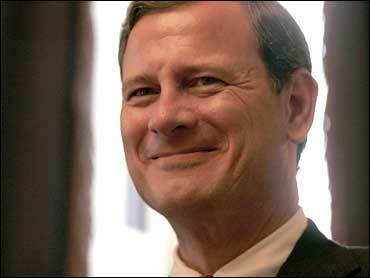 Roberts, a conservative federal appeals court judge and former lawyer for the Reagan and George H.W. Bush administrations, is assured confirmation. Two-thirds of the 100 senators — Republican and Democrats alike – had already announced their support of Roberts as Rehnquist's successor even before the Senate opened debate. Underplaying Roberts' near-certain confirmation, Mr. Bush said he was cautiously optimistic that Roberts would be approved. "Our duties are clear," Frist said. "The question each of us must answer is: Is John Roberts fit to become chief justice of the United States?" His Democratic supporters say they're still worried about how Roberts — Rehnquist's former Supreme Court clerk — will rule on the bench, but he is undeniably qualified for the position of chief justice. "Judge Roberts' impeccable legal credentials, his reputation and record as a fair-minded person, and his commitment to modesty and respect for precedent have persuaded me that he will not bring an ideological agenda," said Sen. Russ Feingold of Wisconsin, one of three Judiciary Committee Democrats who crossed party lines and voted for Roberts. It takes a majority vote of the Senate to confirm a judicial nominee, and all 55 Republicans are expected to unify behind Roberts' nomination. Thirteen of the 44 Democrats have declared their support, the latest being Sen. Ken Salazar of Colorado and Mary Landrieu of Louisiana on Sunday. That easily gives Roberts more votes than the last conservative nominee, Clarence Thomas. Thomas was confirmed 52-48 in 1991. President Clinton's two nominees, Ruth Bader Ginsburg and Stephen Breyer, were confirmed 96-3 and 87-9, respectively. Democrats opposing Roberts say they're afraid the former lawyer in the Reagan and George H.W. Bush administrations will be staunchly conservative like Thomas and Justice Antonin Scalia. They question Roberts' commitment to civil rights and expressed concern that he might overturn the 1973 court ruling that established the right to abortion. The White House refused to release paperwork from Roberts' time as a deputy solicitor general in the first Bush administration, and the nominee refused to fully answer Democrats' questions during his confirmation hearing two weeks ago. Sen. Evan Bayh, a possible Democratic presidential candidate in 2008, introduced Roberts to the Senate Judiciary Committee for the confirmation hearings. But he will vote against him, he said. "I cannot vote to confirm, not because I oppose John Roberts, but because we simply do not know enough about his views on critical issues to make a considered judgment," Bayh said. The limited information from the nominee's paper record raised troubling issues about Roberts' judicial temperament, said Sen. Mark Dayton, D-Minn.
"I am deeply concerned that he and President Bush's next nominee will shift the Supreme Court close to the extreme right for many years to come," Dayton said. Some say Democrats are using the Roberts confirmation to prepare for a battle over the O'Connor vacancy. "The more Democrats who vote for Roberts the better the argument will be for them to oppose the president's next nominee, who will replace Sandra Day O'Connor, the justice who for many years now has staked out the court's moderate center," says CBS News Legal Analyst Andrew Cohen. "If the president doesn't pick someone in the O'Connor mold I expect the donneybrook we did not see this time out." Specter said he thinks the president might name a successor within days of Roberts' confirmation. O'Connor often has been a swing vote, a majority maker whose retirement could signal a shift on the court on many contentious issues.